Gotham Books, 2012. 287 pages. It was actually my 26-year-old son who gave this book to me – and did a brilliant thing in so doing. Two of my top three Sonderbooks Stand-outs in Nonfiction this year were given to me by him. Of course, I’d already read and loved The Gifts of Imperfection, by the same author, so I was expecting this book to have helpful insights. I was not disappointed. The first time I read this quote, I thought, This is vulnerablilty. Everything I’ve learned from over a decade of research on vulnerability has taught me this exact lesson. Vulnerability is not knowing victory or defeat, it’s understanding the necessity of both; it’s engaging. It’s being all in. Vulnerability is not weakness, and the uncertainty, risk, and emotional exposure we face every day are not optional. Our only choice is a question of engagement. Our willingness to own and engage with out vulnerability determines the depth of our courage and the clarity of our purpose; the level to which we protect ourselves from being vulnerable is a measure of our fear and disconnection. She takes us on a journey to answer these questions, and the journey takes us in some surprising directions. First, she looks at what we’re up against in our “Never Enough” culture. She talks about how it’s hard to be vulnerable when you’re wrapped up by a culture of shame. The opposite of scarcity is enough, or what I call Wholeheartedness. . . . There are many tenets of Wholeheartedness, but at its very core is vulnerability and worthiness: facing uncertainty, exposure, and emotional risks, and knowing that I am enough. Next, she debunks some myths about vulnerability and reminds us we're all in this together. Then she tackles the topic of how shame fits in and keeps us from being vulnerable. Shame derives its power from being unspeakable. That's why it loves perfectionists -- it's so easy to keep us quiet. If we cultivate enough awareness about shame to name it and speak to it, we've basically cut it off at the knees. Shame hates having words wrapped around it. If we speak shame, it begins to wither. Just the way exposure to light was deadly for the gremlins, language and story bring light to shame and destroy it. She talks about combating shame, and the elements of shame resilience. I mean the ability to practice authenticity when we experience shame, to move through the experience without sacrificing our values, and to come out on the other side of the shame experience with more courage, compassion, and connection than we had going into it. Shame resilience is about moving from shame to empathy -- the real antidote to shame. If we can share our story with someone who responds with empathy and understanding, shame can't survive. Self-compassion is also critically important, but because shame is a social concept -- it happens between people -- it also heals best between people. A social wound needs a social balm, and empathy is that balm. Self-compassion is key because when we're able to be gentle with ourselves in the midst of shame, we're more likely to reach out, connect, and experience empathy. There's a section here on how men and women experience shame differently and how lethal it can be to relationships. But she also looks at people who have learned to have shame resilience. As I look back on what I've learned about shame, gender, and worthiness, the greatest lesson is this: If we're going to find our way out of shame and back to each other, vulnerability is the path and courage is the light. To set down those lists of what we're supposed to be is brave. To love ourselves and support each other in the process of becoming real is perhaps the greatest single act of daring greatly. Chapter 4 looks at The Vulnerability Armory -- the ways we protect ourselves from being vulnerable. And along with that she looks at the strategies that empower people to take off the masks and armor. The three forms of shielding that I am about to introduce are what I refer to as the "common vulnerability arsenal" because I have found that we all incorporate them into our personal armor in some way. These include foreboding joy, or the paradoxical dread that clamps down on momentary joyfulness; perfectionism, or believing that doing everything perfectly means you'll never feel shame; and numbing, the embrace of whatever deadens the pain of discomfort and pain. Each shield is followed by "Daring Greatly" strategies, all variants on "being enough" that have proved to be effective at disarming the three common forms of shielding. And I loved the importance she placed on joy and practicing gratitude. Even those of us who have learned to "lean into" joy and embrace our experiences are not immune to the uncomfortable quake of vulnerability that often accompanies joyful moments. We've just learned how to use it as a reminder rather than a warning shot. What was the most surprising (and life changing) difference for me was the nature of that reminder: For those welcoming the experience, the shudder of vulnerability that accompanies joy is an invitation to practice gratitude, to acknowledge how truly grateful we are for the person, the beauty, the connection, or simply the moment before us. Gratitude, therefore, emerged from the data as the antidote to foreboding joy. In fact, every participant who spoke about the ability to stay open to joy also talked about the importance of practicing gratitude. This pattern of association was so thoroughly prevalent in the data that I made a commitment as a researcher not to talk about joy without talking about gratitude. It wasn't just the relationship between joy and gratitude that took me by surprise. I was also startled by the fact that research participants consistently described both joyfulness and gratitude as spiritual practices that were bound to a belief in human connectedness and a power greater than us. Their stories and descriptions expanded on this, pointing to a clear distinction between happiness and joy. Participants described happiness as an emotion that's connected to circumstances, and they described joy as a spiritual way of engaging with the world that's connected to practicing gratitude. While I was initially taken aback by the relationship between joy and vulnerability, it now makes perfect sense to me, and I can see why gratitude would be the antidote to foreboding joy. She looks in great depth at additional ways to combat foreboding joy, perfectionism, numbing, and many other shields we use to hide from vulnerability. After this she looks at the big picture. How can we cultivate change and fight disengagement and disconnection? And she looks specifically at ways of humanizing education and work to be a better teacher or leader. 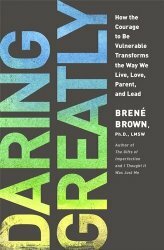 And she wraps it up with a chapter on wholehearted parenting, "daring to be the adults we want our children to be and raising shame-resilient children. I highly recommend this book. It will inspire you to Dare Greatly.